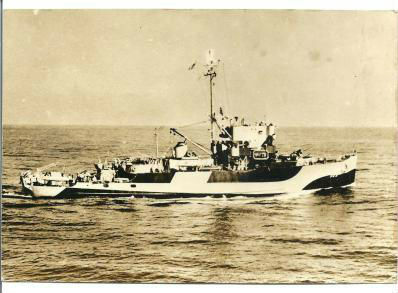 USS Strength (AM-309) was a metal-hulled Admirable-class minesweeper built for the U.S. Navy during World War II. She was laid down on 4 October 1943 by Associated Shipbuilders, Seattle, Washington; launched on 28 March 1944; sponsored by Mrs. H. W. McCurdy; and commissioned on 30 September 1944. The Strength participated in mine-sweeping operations off Iwo Jima, Kerama Retto, and Okinawa. It also served as a training hulk for Navy salvage divers in Washington, D.C., and then Panama City. The ship successfully fought off separate attacks by a Japanese midget submarine and a kamikaze plane and was awarded three battle stars for her service in World War II. ship is 184 feet in length with a 33-foot beam. At her sinking, she came to rest on her side in about 76 feet of water. The ship was pushed upright by Hurricane Opal in 1995. The profile rises to within 40 feet of the surface and at less than 80 feet, divers can easily swim between the two sections of Strength’s hull where her bow is separated from the rest of the ship. The A plaque on her side tells the history of the ship. After being de-commissioned, the Strength was given to the Navy’s Salvage Diver School. Here she was sunk as a salvage project, being re-floated and re-sunk many times. In 1987 she was sunk for the last time in an explosive test by the Navy Diving and Salvage Training Center at Panama City and began her new life as an artificial reef. Today the Strength sits on her starboard side in 72 feet of water. The Strength’s wreckage rises to within 41 feet of the surface and is considered one of the area’s most popular dive sites.